A web-based repository of pro bono opportunities for lawyers in the State of Idaho. Two legal aid nonprofits in Idaho, the Idaho Volunteer Lawyers Project (IVLP), and Idaho Legal Aid Services (ILAS), offer opportunities for lawyers in the state to do pro bono (professional volunteer) work. But each nonprofit had to reach out individually to lawyers to take on pro bono cases. 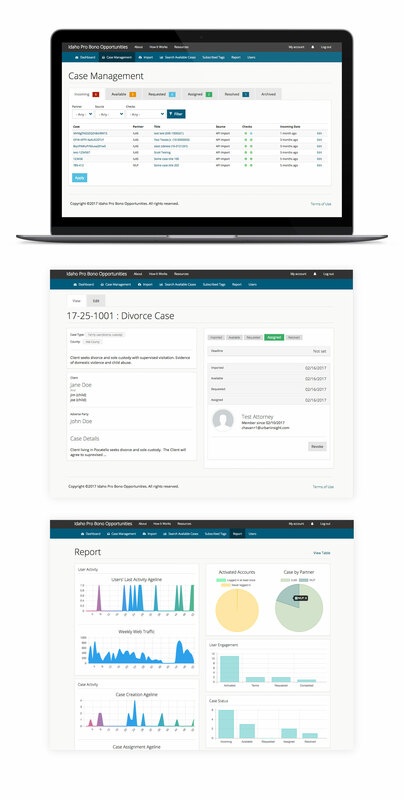 To make the process of connecting lawyers with a suitable pro bono case simpler and easier, the state needed a single repository that could pool cases from both nonprofits and alert lawyers when new cases were available. Urban Insight designed a web-based repository called the Idaho Pro Bono Opportunities Website (PBOW). This transformative system helps people in need of free legal assistance to be matched with a lawyer willing to take on their case, even when the two people may be in physically different locations. The system maps equivalent data fields among nonprofit’s case data. Legal aid programs can used an automated system to import legal cases into the nonprofit’s own case management system. Lawyers receive email notifications when a case matching their interests become available. An easy-to-use dashboard visualizing system activity allows easy monitoring. — Steven J. Rapp, Technology Project Developer, Idaho Legal Aid Services, Inc.